PUTRAJAYA: The Communications and Multimedia Ministry is currently undergoing a process of restructuring and improving several departments and agencies to improve its services and delivery system to the rakyat, said its Minister Gobind Singh Deo. The ministry is currently restructuring the Information Department and improving the services of Radio Televisyen Malaysia (RTM) and Malaysia National News Agency (Bernama), he said. “Such processes would take time to complete,” he told reporters after presenting Excellence Services Awards (APC) to 612 recipients here today. 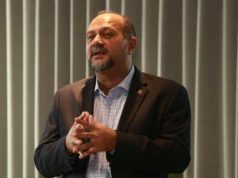 To claims made by PKR Youth that lack of information and lack of reach of government channels were among the reasons why Pakatan Harapan lost in the recent Rantau by-election, Gobind reiterated his pledge to continue to improve services and disseminate proper information to the people through relevant departments and agencies. “My position is that we are doing our best. I think you can see some improvements made in the last couple of months. “At the end of the day, I think we have done well, and there is a lot more to do, we can improve. We will do our best to improve in the months to come,” he said. On the status of the media council, Gobind said he would be in touch with Prime Minister’s Special Advisor on Media and Communications Datuk A.Kadir Jasin on the matter and was also informed that the stakeholders were ready to meet him with the proposals. “I will definitely inform the media if there are any developments on the media council, especially on the decisions made and what are the suggestions,” he said. When asked to comment on Gerakan President Datuk Dominic Liu statement on politicians suing the media, Gobind said there was a provision under the law for individuals including politicians to sue it in order to clear their tarnished names. “My position has always been that if a report is written against an individual who thinks it is unfair, the person can communicate with the reporter to explain the correct version. Then, the problem ends here. “But if the person is still unhappy with what has been corrected and thinks he or she has been defamed, then they can take legal action against the reporter,” said Gobind, who is also DAP’s deputy chairman. It was reported Gerakan President Dominic Lau last Saturday said the party would take action against its members who sued the media over news reports, and took a dig at a particular politician who loves to sue the media. Previous articleவேலூரில் தேர்தல் நிறுத்தி வைக்கப்படலாம், குடியரசு தலைவர் முடிவு! Next articleமுகநூல் பக்கத்தில் அதிகம் பின் தொடரப்படும் தலைவர் பட்டியலில் மோடி முதலிடம்!